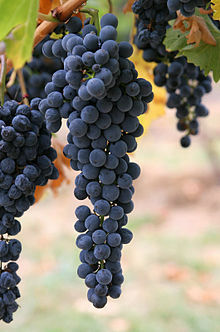 a bunch of grapes 一房のぶどう. a bunch of flowers 花束. a bunch of idlers ぶらぶらしている連中. His muscles bunched under his shirt. From Middle English bunche (“hump, swelling”), perhaps a variant of *bunge (compare dialectal English bung (“heap, grape bunch”)), from Proto-Germanic *bunkō, *bunkô, *bungǭ (“heap, crowd”) (compare West Frisian bonke (“bone, lump, bump”), German Bunge (“tuber”), Danish bunke (“heap, pile”)), from Proto-Indo-European *bʰenǵʰ-, *bʰéng̑ʰus (“thick, dense, fat”) (compare Hittite panku (“total, entire”), Tocharian B pkante (“volume, fatness”), Lithuanian búožė (“knob”), Ancient Greek παχύς (pakhús, “thick”), Sanskrit बहु (bahú, “thick; much”)). A group of similar things, either growing together, or in a cluster or clump, usually fastened together. When we had examined this last find, Lord Godalming and Quincey Morris taking accurate notes of the various addresses of the houses in the East and the South, took with them the keys in a great bunch, and set out to destroy the boxes in these places. (cycling) The peloton; the main group of riders formed during a race. He still hangs out with the same bunch. (US, informal) A considerable amount. (informal) An unmentioned amount; a number. A bunch of them went down to the field. (forestry) A group of logs tied together for skidding. (geology, mining) An unusual concentration of ore in a lode or a small, discontinuous occurrence or patch of ore in the wallrock. (textiles) The reserve yarn on the filling bobbin to allow continuous weaving between the time of indication from the midget feeler until a new bobbin is put in the shuttle. An unfinished cigar, before the wrapper leaf is added. Two to four filler leaves are laid end to end and rolled into the two halves of the binder leaves, making up what is called the bunch. They will carry […] their treasures upon the bunches of camels. (transitive) To gather into a bunch. (transitive) To gather fabric into folds. (intransitive) To form a bunch.